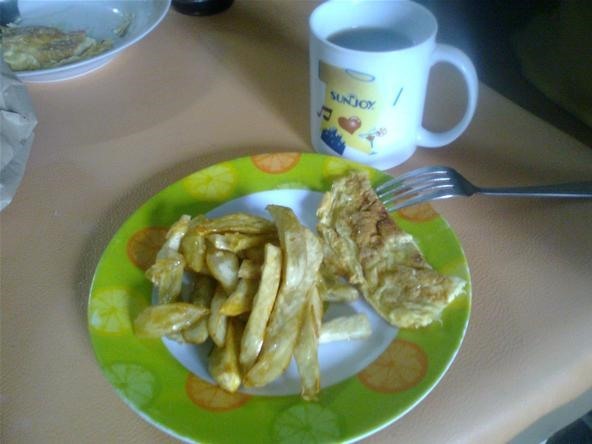 Older Filipinos love eating camotes, also known as sweet potato fries, for breakfast. Aside from filling your stomach completely, it also has fewer carbs than regular white rice. But, we, the Filipino generation Y, are more used to potato fries, known more commonly as French fries, served in fast food restaurants. 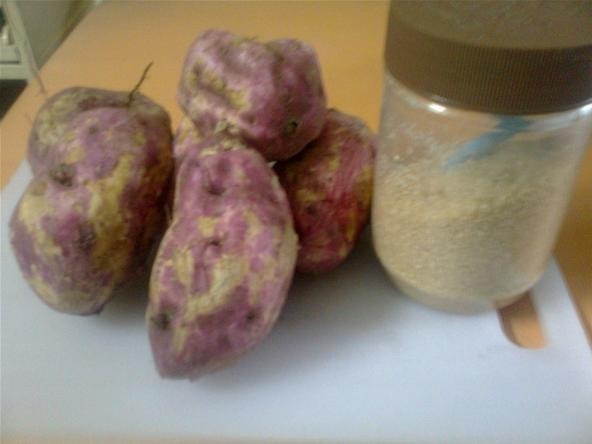 So when I woke up with a craving for potato fries, I opted to make my own version using camote or sweet potatoes. Step 1 Peel sweet potatoes. Scrub and wash the sweet potatoes thoroughly. 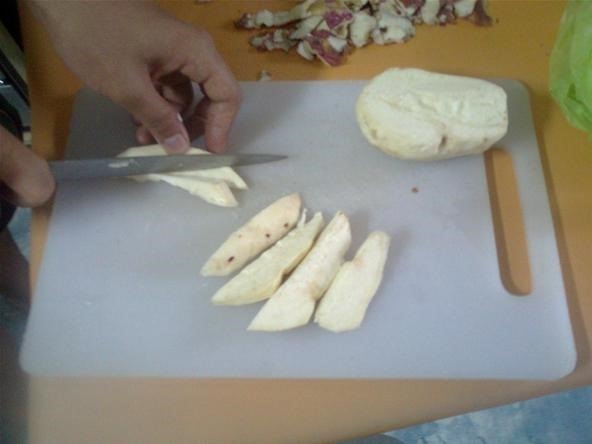 Use a knife or vegetable peeler to peel off skin. Step 2 Slice into thick strips. Slice the sweet potatoes into strips. 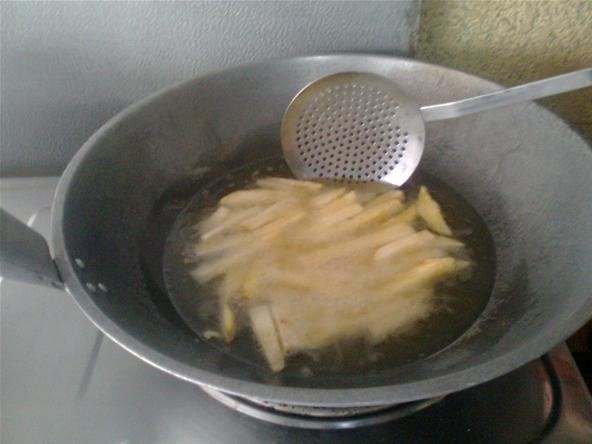 Heat 3-5 cups of vegetable oil in a deep pan for deep frying. Step 4 Fry sweet potato strips. 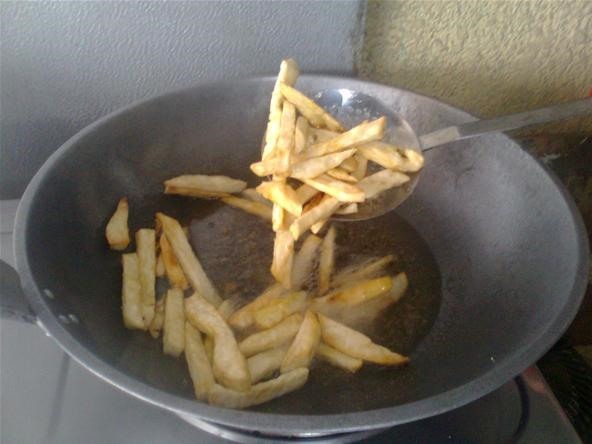 Put a handful of potato strips into hot oil and deep fry in batches. Sprinkle about 3-4 teaspoons of brown sugar while deep frying the sweet potatoes. 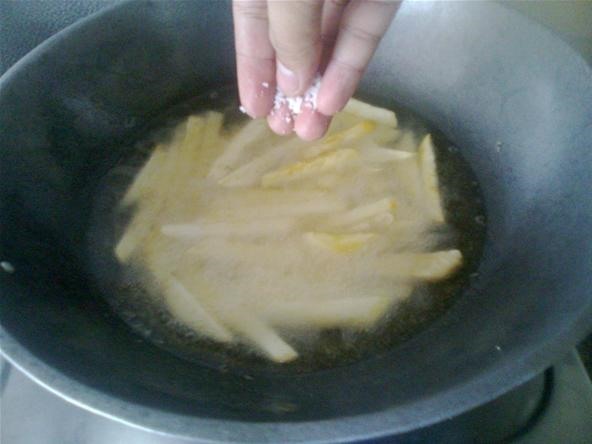 Sprinkle about a pinch of salt after adding sugar. Step 7 Continue stirring until done. Stir the sweet potatoes. The sugar will dissolve in the heat and caramelize. Then the caramelized sugar will stick to the potatoes, which gives your fries a sweet taste. 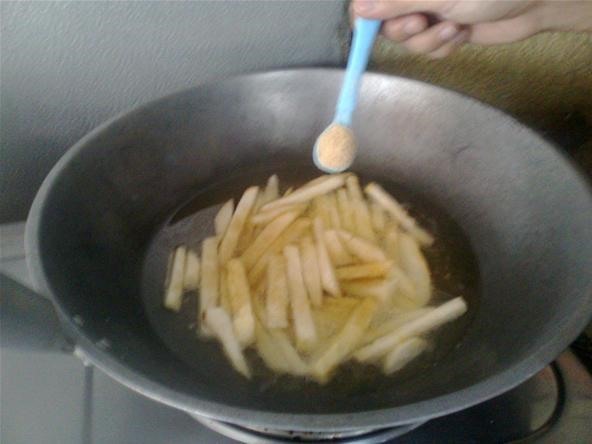 You'll know it's cooked when the color of the fries turns slightly golden brown. 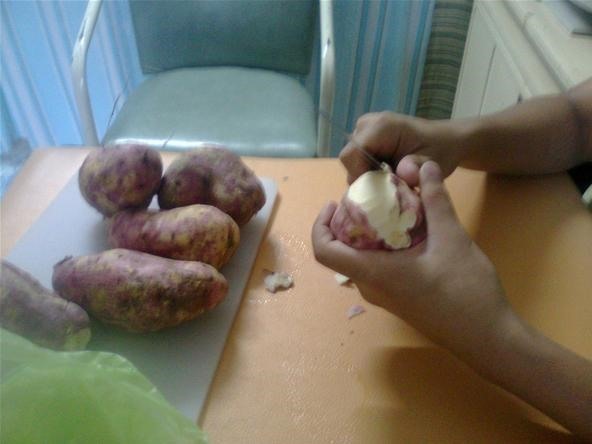 Take a piece of sweet potato to make sure that it is already cooked. When the texture at the center of the slice is already soft, then it is already cooked. The outside maybe a bit crunchy due to the caramelized sugar. Step 8 Serve on a plate. Serve on a plate with a hot cup of coffee or a glass of cold juice. Do not immediately touch or eat if it is still too hot. You may burn your tongue. It's a nice breakfast dish for those on a diet. You may skip the sugar if you don't want to sweeten the sweet potatoes more. I like sweet potatoes. To my taste they are sweet enough with out adding the sugar after all they are already sweet.